The approximately 90 square kilometer Greek island group (also Sandorini or Santorini) is the southernmost of the Cyclades group and lies in the Aegean about 100 kilometers north of Crete, The crescent-shaped main island is called Thira and forms with the two opposite small islands Aspronisi (0.14 km²) and Thirasia (9 km ²) a boiler. The ring-shaped island is from a massive volcano explosion around 1500 BC. Were created, which the Minoan culture (Bronze Age culture of Crete) was destroyed. At the beginning of the 13th to the end of the 16th century the island was strongly influenced by Venice, which developed an important wine culture. At that time she received the name Santorini after Santa Irene (St. Irene). In particular, the strong alcoholic sweet wines were highly valued for their storage and transport ability and were then on the port city Monemvasia (Peloponnese) shipped to many European countries. Although the island was conquered by the Turks in 1579, there was no restriction on viticulture. The Ottoman rule lasted until the Greek Revolution of 1821. The summer is warm, dry and almost rainless, the winter mild with few but heavy rains. By 1950, there were still 4,800 hectares of vineyards, which have shrunk due to the construction boom on about 1,200 hectares. 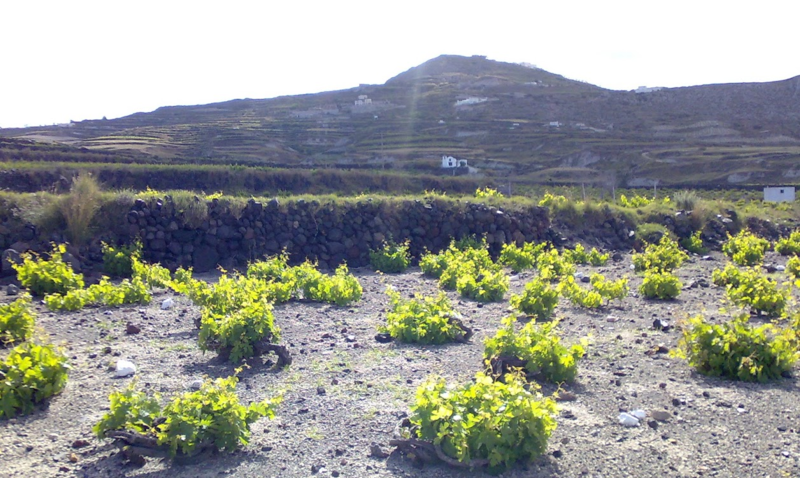 On mainly volcanic, ideal for viticulture soil around 30 indigenous grape varieties are cultivated. The porous soil has a good one Water storage capacity, In the soft material were numerous Canavas (Caves) created, which are often used as a wine cellar. The vines will be ungrafted grown because of the island of phylloxera has been spared. To 80% white wines are cultivated. The Assyrtiko dominates with 90%, followed by Aïdani Aspro and Athiri Aspro, The three are for the POP wines authorized. The most important red wines are Mandilaria. 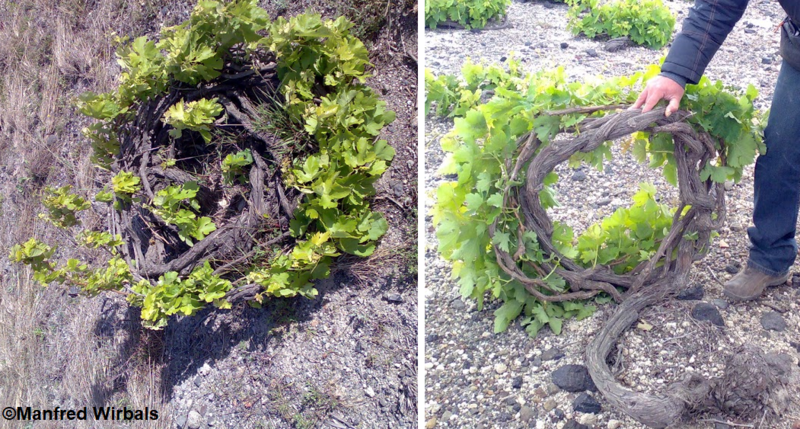 Mavrotragano and Athiri Mavro, The vines are in the educational form Kouloura In the form of wreaths low educated to protect the inside growing grapes from the strong, sandy winds. The yields are relatively low, the wines reach high acidity. The main island of Santorini and the small island of Thirasia were declared in 1972 as an appellation. There is one classified as POP white wine in dry and sweet, which is blended from the varieties Assyrtiko (at least 75%), and Aïdani Aspro and Athiri (maximum 25%). As Vinsanto designated sweet version of dried grapes has an age-old tradition here. This sweet wine probably served as a model for the Italian Vin Santo, A specialty is the dry white wine "Nykteri" (night work), whose name refers to the grape harvest from dusk and the work ending in the early morning hours. It is aged in wooden barrels and stored for several years. The dry land wines are called "Brousko" (from the Italian brusco = coarse, herb). For a long period read different white wine varieties are stored for a long time in open vats, causing it to oxidative Processes is coming. After pressing, the must ferments to a brownish, strong and alcoholic tannin Wine with a rustic character. This page was last modified at 4 April 2019 at 15:13.